Sometimes, we lock our keys in our car. Maybe you were in a hurry and didn’t realize your keys were still in the front seat. Maybe you bumped your door by accident and happened to lock it before you meant to. Whatever the case, locking your keys in your car can put a damper on the rest of your day like few other accidents can. Luckily, we here at Redlands Lock & Key are here to help Colton area residents make sure that they never have to stay locked out of their own vehicle. With our emergency mobile lock and key services, we are able to come to you and help you get back into your vehicle as quickly as possible. In today’s post, we are going to go over some of the reasons why we feel our emergency mobile locksmith service is a value to our customers. Continue reading below to learn more. Even though locking your keys in your car is inconvenient, it doesn’t have to ruin your day. Below, we have listed a few of the reasons that our mobile locksmith service is so valuable. Fast Results: Usually, people don’t lock their keys in their vehicle when it is convenient. This means that every moment they have to wait to get back into their vehicle is a moment wasted. When you call us to unlock your vehicle, you can rest assured that we will be there as fast as humanly possible. We understand how valuable your time is and will take every step to make sure that we can help you get back into your vehicle in a timely manner. Skill: While advancements in anti-theft systems for vehicles have, overall, been a good thing, they can sometimes make it difficult to get into a vehicle that has been locked. For this reason, it is important that you choose a Colton locksmith that is able to get into your vehicle without causing any damage to the exterior or interior of the door. At Redlands Lock & Key, our locksmiths are trained to use the most advanced tools and techniques to get into your vehicle. 24/7 Service: Nothing is worse than calling a locksmith to see if they can help you unlock your vehicle only to find that they are closed for the day. While it might not be convenient for a locksmith to be on call 24/7, locking your keys in your vehicle is not exactly the most convenient thing either. Our locksmiths are on call whenever you need them so that you never have to worry about whether or not you will be able to get back into your vehicle. Thank you for reading our short blog on the reasons we believe our emergency mobile locksmith services are so valuable. If you would like to learn more about the services that we provide, please do not hesitate to visit our main site and read a little more about us. 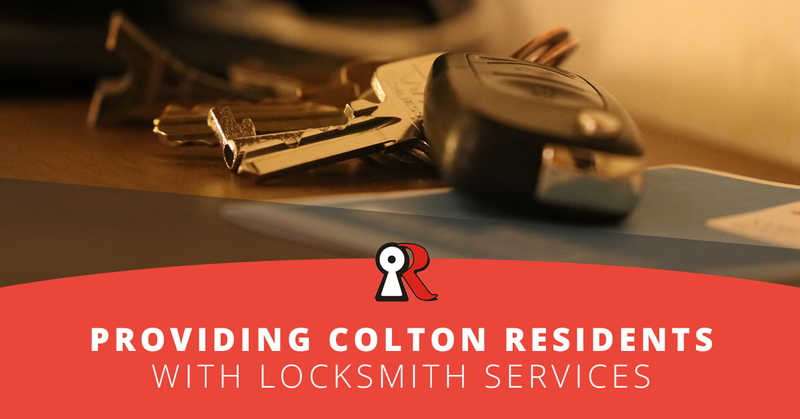 We have been helping Redlands area residents for years with their locksmith needs and we cannot wait to show Colton residents why we have become such a trusted name in the locksmith industry.